Beautiful Victorian details celebrated with six colors and gold leaf! 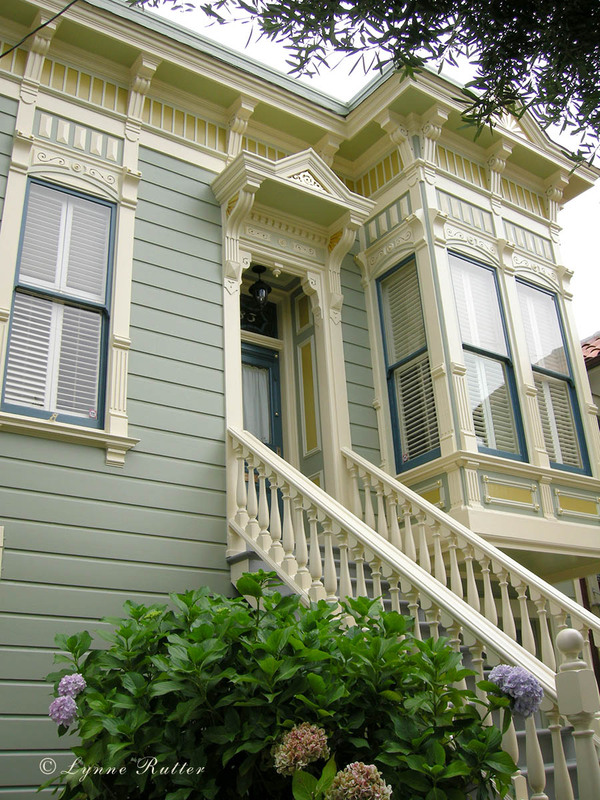 This Victorian in San Francisco's Noe Valley could not help being a bit cute. 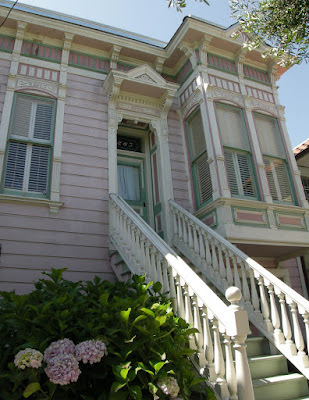 The Stick-Eastlake Cottage had been painted about 15 years ago using the pink colors from the magnificent hortensia blooming in its front entry. When it came time to repaint, the owners asked me to design something a bit more grown-up. 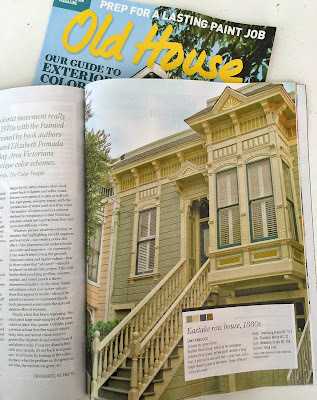 Choosing a Color: I ask my clients to drive around town and photograph houses of similar style whose paint schemes appealed to them. Every one they chose was green! So we started with green. The color scheme I devised for this house uses six colors, all from from Benjamin Moore's Historic Color range, with 23 karat gold leaf on the buttons and pediment ornaments. Managing contrast: This palette is as much about contrast as it is about color. One technique being employed here is the use of what I call a "secondary trim" color, which in this case is about 30% darker in value than the main trim color, and is used to support features like brackets and window columns, and to create a break between the main body color of the house and the more vibrant accent colors of the window sashes and insets. Know when to say when: The custom garage door was simplified from three colors to one, and painted the same as the body color, so as not to compete for attention from the main part of the facade. The front door, which had been whimsically painted with four different colors, now sports a more European look in a solid glossy teal with polished hardware and gold leaf details, leading the eye right to the entrance. This project has been featured in the June 2015 issue of Old House Journal. After nearly 8 years, this is still one of my most talked about color designs. At this time I can say that the basic colors for this scheme are Louisberg Green and Standish White by Benjamin Moore. You will notice in the OHJ article several other uses of Louisberg Green and see how very different that color can look depending on the environment, orientation and accent colors. Wonderfully told! The color palette is very sophisticated. I love the first photo! Well done. beautiful! i love the subtle contrast. Delicious, Lynne....like a wonderful creamy lime sorbet. Your color sense is amazing. Also, I wish I could take your cloud class. You have so much to offer...your students will be so lucky. LOVE! 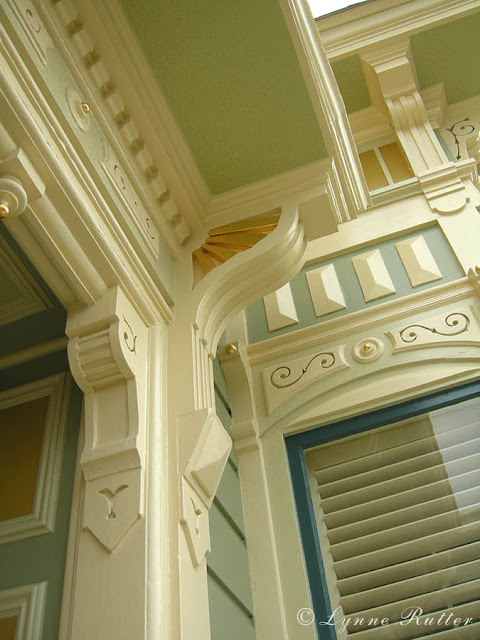 What gorgeous color combinations -- and how lucky to have a home that has the architecture to truly show your talent off. Your cloud class looks amazing, btw! Love the colors! Can you tell me what BM HC color you used for the body of the house? Hi Katie- I am sure you understand that if you find a match for this color it won't look the same for you as it does here. Best to just try out what looks best in your light and with your architecture. I really like the HC color because they work well together and in the San Francisco combo of sun and fog they are both subtle and vibrant. And if you need help, call a colorist! Great combo here. The blue looks very similar to what I have on my home. Is it Noturnal Gray - Benjamin Moore? no it's a different color, but it's not the single color that makes the effect- it's the combination of them. Any chance you'd be willing to disclose the color palate? I get that the lighting is different and so on and so forth...but would love to know the color names. Thanks! I am sorry, Anonymous, but my clients paid me to design this color palette for them. This blog post is meant to show how the decisions are made. I go through this process with every project and the results are unique each time. Look at Benjamin Moore's Palladium Blue for the main color. Nope, that's not it. But that's a lovely one I have used elsewhere. How funny. 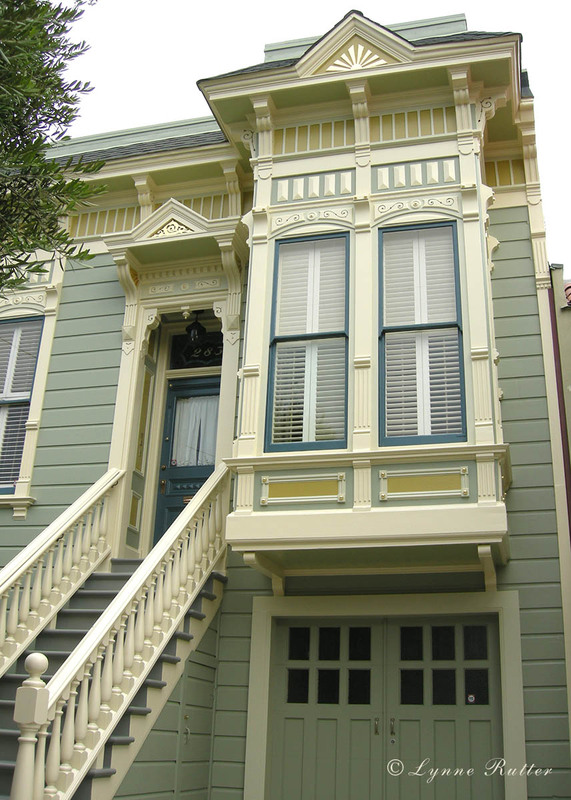 I walked all over Noe Valley, Castro, Mission to find the perfect color scheme for my Russian River bungalow and yours is the one I picked. Then I found it on here as well. Unfortunately when I got back to the river with my new colors I realized the house next door had a similar green/blue color....soooo....what else do ya got? Clearly you are a Master of color- simply stunning. If I ever buy my own Vic, I'm calling you!